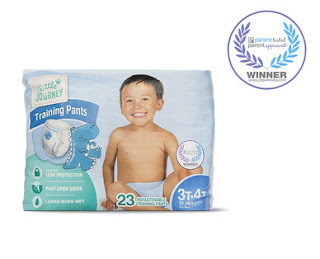 This past summer Aldi rolled out a new line of baby products including training pants in 3T/4T size. We have been using these for nighttime with out preschooler until recently when he completed potty training. They are priced at $5.99 a pack in our area making them $.26 per "pull-up." Target's Up and Up come in at $.32 and Walmart's Parents Choice at $.31 making Aldi's s substantially cheaper. I believe these are comparable in quality to Pull-Ups and any of the house brands at local stores. They are not meant to substitute for a diaper, so they are not totally leak-free if you have a heavy overnight wetter, but they do help make that transition at training time from diaper to underwear. I was tempted to not even share this information since I kind of like how many people seem to miss these deals at Aldi. When they pass them over it means better deals for me! Since I am in a giving mood, I will go ahead and share this tidbit. Aldi marks down meat to half-price when it is getting close to its "use-by date." Packages will be marked with a red half-priced sticker like the one shown. I snag as many of these as I can and freeze them for later use. I think I might have squealed with delight in the aisle when I scored these deals on the Never Any Chicken Tenderloins. Tip: If you want to kind to the cashiers, save these items to put last on the belt when you unload your cart. They have to hand key the half-price so it slows them down to do them here and there rather than all at the end.